Steven Adair MacDonald Associate Attorney Stephanie Foster focuses her practice on real estate and civil litigation, with a background in constitutional law and commercial real estate. Stephanie has been instrumental in obtaining settlements for individuals, both landlords and tenants, in numerous landlord tenant cases and real property disputes. 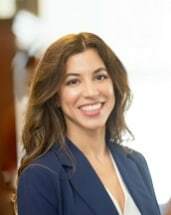 Additionally, Stephanie has litigation experience, having tried numerous cases in both San Francisco and Alameda Superior Courts. Stephanie is a member of the State Bar of California, the American Bar Association, the San Francisco Bar Association, and the Los Angeles Bar Association. Stephanie obtained her J.D from Southwestern Law School, where she was a Dean's Merit Scholar, John J. Schumacher Minority Leadership Scholarship recipient, and was awarded the ALI-ABA Scholar and Leadership Award in 2011. Additionally, Stephanie served as the managing editor for the Southwestern Journal of International Law. She received her B.A. from the University of San Francisco. Born and raised in Los Angeles, Stephanie relocated to San Francisco in 2011. She volunteers with various youth programs at the YMCA and enjoys sailing, golfing, and cooking. Stephanie and her husband have three sons who keep them very busy.